Here in Australia we’ve just started our last term of the year. That means, soon we’ll be saying good bye to the beautiful students we’ve been teaching all year long. It also means that we’ll be meeting and greeting our new grades for 2016, too, which is always a very exciting time, too. But it does involve a bit of organising! I teach Foundation – the entry year to school, sometimes called Prep or Kinder – and next week we start our Transition Program for 2016. That means students enrolled for next year come for five 1-2 hour sessions where they become familiar with our school and surroundings, they meet the current Foundation teachers, and their buddies (a Grade 5 or 6 student who will help look after them) for the following year. It’s a really wonderful program that I’ve had the privilege of participating in for the last 5 (soon to be 6) years. At the culmination of this program, the fifth session is where incoming students get to meet their teacher for the very first time. It’s only a short time, but it’s special. Students get a special show bag with simple, fun activities for the holidays and walk away knowing who’s going to be teaching them and what their classroom looks like. But, do I leave it there? No way! These are my badges for the last two years. I just print them off, laminate them, cut them out, punch a hole and attach a safety pin. Every child gets one, and the whole class walks out knowing their part of my class. It’s a lovely way to foster community even before students ‘officially’ start school! I’m in the process of designing my badge for this year, but if you’re interested, I’ll share it with you later! 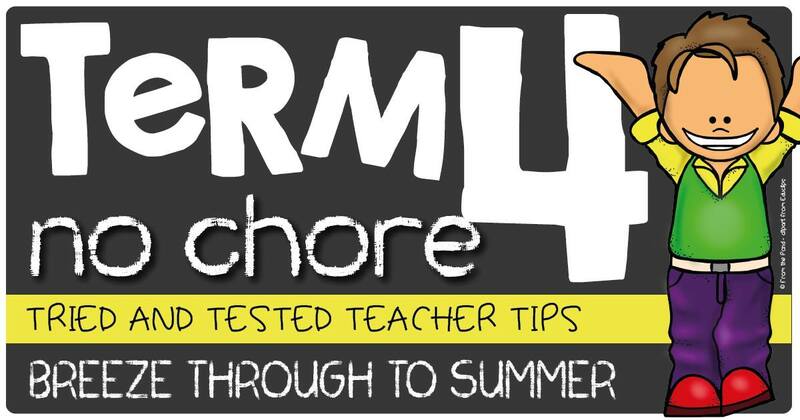 Don’t forget to check out the link-up and all the other fab ideas, tips and tricks for term 4! Follow me on Facebook and Instagram, too, for more ideas! I’d also love for you to share YOUR tips and tricks in the comments, too! Until next time friends, happy teaching! So, we’re back at it again, this time we’re celebrating the change in the seasons – in both hemispheres! Here in Australia the weather is starting to cool as we start our journey from Autumn to Winter, while I know many of my Northern Hemisphere friends are cheering the warmer weather in! 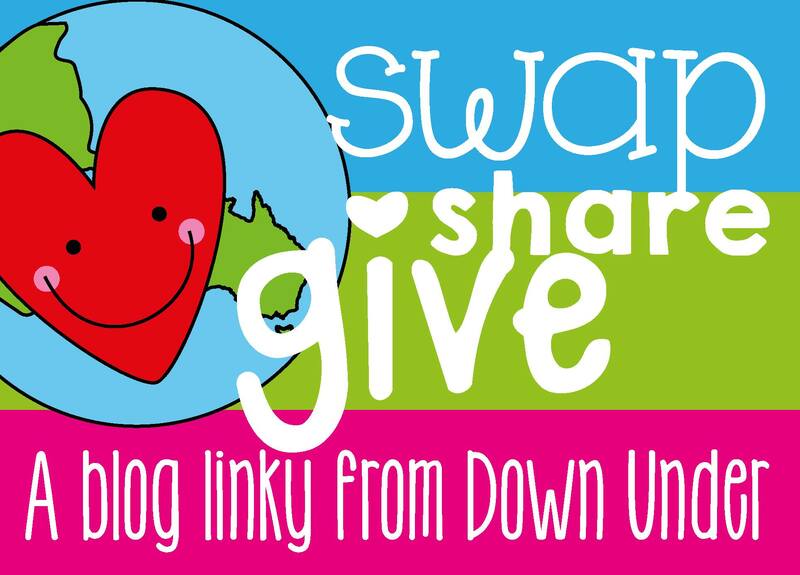 For those of you who’ve not experienced the Swap, Share, Give linky, a few of my good teacher friends from around Australia have gotten together to swap a product for review, provide YOU with a fun freebie and offer a piece of advice based on our teaching experiences. So, without further ado, let’s get on with the show! I was so lucky to have the opportunity to swap a product with the lovely Lauren, from Love, Laughter and Learning in Prep. If you haven’t been to her blog, stop what you’re doing and RUN over there, especially if you’re a Prep/Kinder teacher. She always has such fabulous ideas and I’m constantly stealing borrowing them! I was very fortunate enough to review her fun new pack that combines word work AND fine motor skills! Now, Lauren has an amazing collection of Fine Motor activities in her store, and I’ve actually used some of them before, but this one looked amazing for my class at the start of this term, because I have some great little readers this year who are learning about word families at the moment. We used this activity as a warm up for our reading, and students worked in pairs to complete the different word family groups. This pack contains the four short ‘a’ word families -ag, -an, -ap and -at. Each word family has a main card with four holes punched in it, plus 4 word cards belonging to that word family in one of three options – pictures (shown above), pictures and words, and just words, which is perfect for providing differentiation for your students! Students find the cards that belong to the depicted word family and use ‘links’ (those ones that EVERYONE has stashed away in their classrooms!) to connect them together, utilising not only their word family knowledge, but also the ability to manipulate and connect small objects together. My kiddos LOVED this activity and have asked to do it a few times since we last had a go. Next time we’ll be using the picture and word cards to extend students and get them focusing on what the words look like now that they’re starting to blend words! Thanks so much to Lauren for swapping with me – click on any of the images below to check out her store! Also, don’t forget to stop by blog to check out her review of one of my products! Celebrate the seasons with your class and create a fabulous seasonal bunting that showcases what students know about each season in this fun freebie for you! Simply click the image above to download, and don’t forget to drop me a comment with your thoughts! This task works fabulous as an individual task, or buddy kids up to create a joint masterpiece that can be strung up in the classroom for an extra pop to your displays! Finally, the fun part! A giveaway from my friends and I to you! Simply fill in your details in the rafflecopter and you’re good to go! And don’t forget to stop by and visit all of my friends, see their fabulous swaps and collect all your freebie goodies by following the links below! 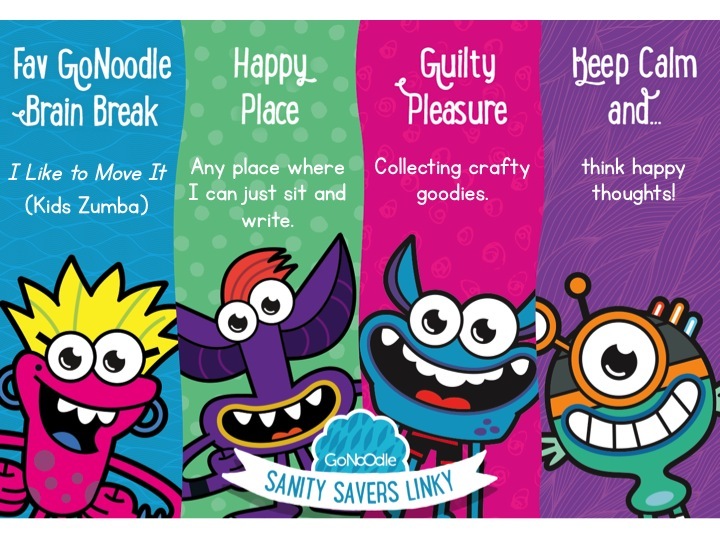 I’m linking up with Elizabeth from Kickin’ It In Kindergarten for her GoNoodle Sanity Savers linky! You all know how much I love GoNoodle, right?!! Fav GoNoodle Brain Break… is definitely I Like to Move It. Mostly because this was the dance that my class did to be involved in GoNoodle and Zumba Kids’ collaboration video last year and they were SOOOOO excited to see themselves dancing alongside many other schools in an online video. My happy place… is anywhere where I can sit and read a book without interruption, or where I can sit and write. Both de-stress me pretty quick. My guilty pleasure… is buying waaaay more craft supplies than I need. I like to bounce around different crafts so I’ve got bits and pieces everywhere. But just like I need time to read and write (see above), I also need time to craft! Don’t forget to head over and see all the other posts in the linky and join in, too! The Silly Season is here and I’m running around like a crazy person. (Well, not right this second… trying to find the will to get up on this lazy Sunday morning!) There is so much to be done and so very little time to do it. 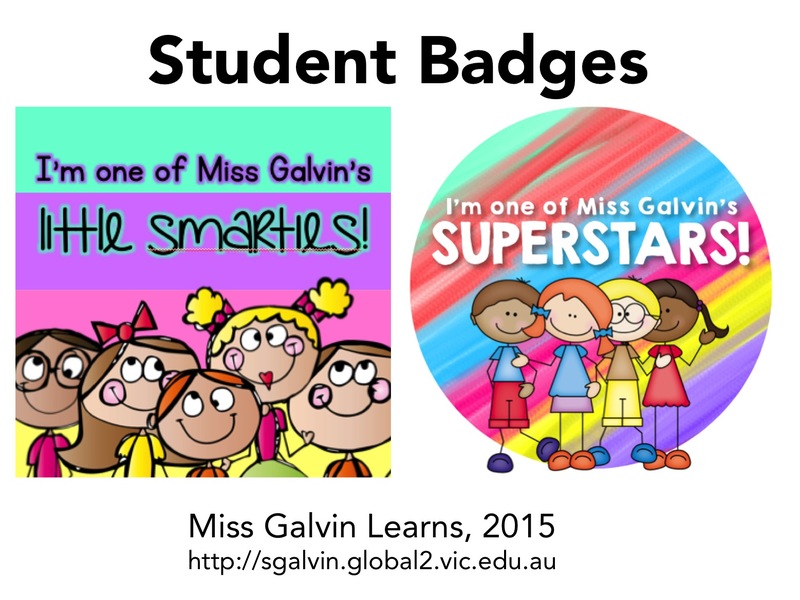 In one week (this Friday) I will say goodbye to my current class – the end of the year is nigh for those of us in Australia – and at the moment it’s a bit of a struggle to get there. But all will be good! 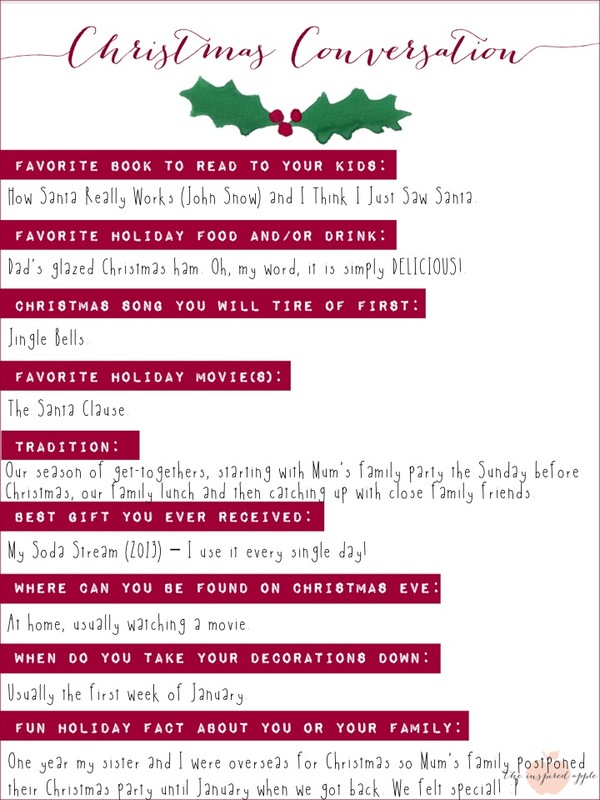 I’m linking up with The Inspired Apple for her Christmas Conversation Linky! Happy holiday season! Don’t forget to link up with your own responses! My lovely, fellow-Australian teacher friends and I have joined forces again for another Swap, Share, Give blog linky this weekend! We had so much fun the last time around we’re back at it, sharing some of the fantastic resources you might have missed! I was paired with the very lovely Jemima from Luck’s Little Learners. Jemima is a fellow Victorian teacher (woohoo!) and if you’re not following her already, you definitely need to stop by and visit her blog, check out her Facebook page, or visit her on Instagram. First up, let me tell you: this pack is designed for the busy teacher. 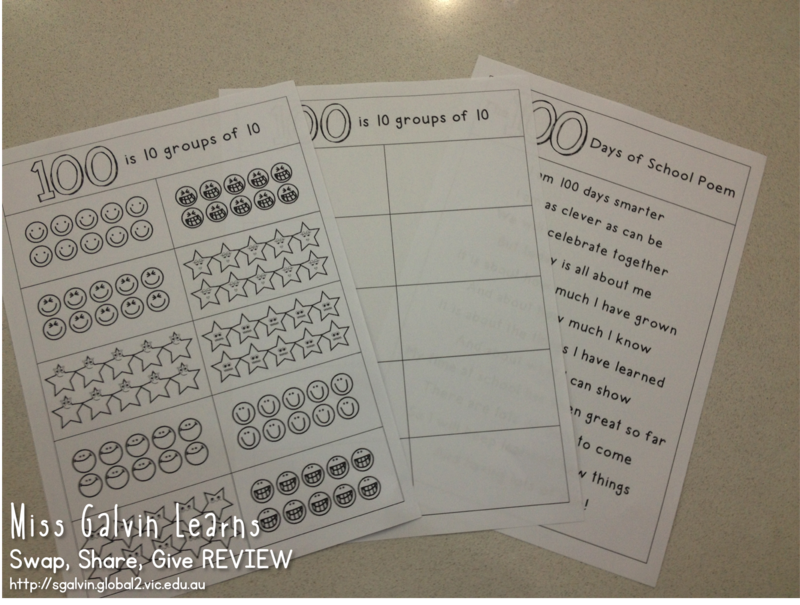 If you (like me) find yourself coming up on 100 days a little time poor, these activities are all PRINT AND GO and are so easy and fun to implement. Great, detail activity ideas and instructions! 100s charts – a whole variety so that you can differentiate for your kids (or skills) as required. Also included (but not in the photo) is a hundreds chart with random numbers missing. I used these as early finishers tasks on the day and they worked a treat! Ways of Making 10 pages. 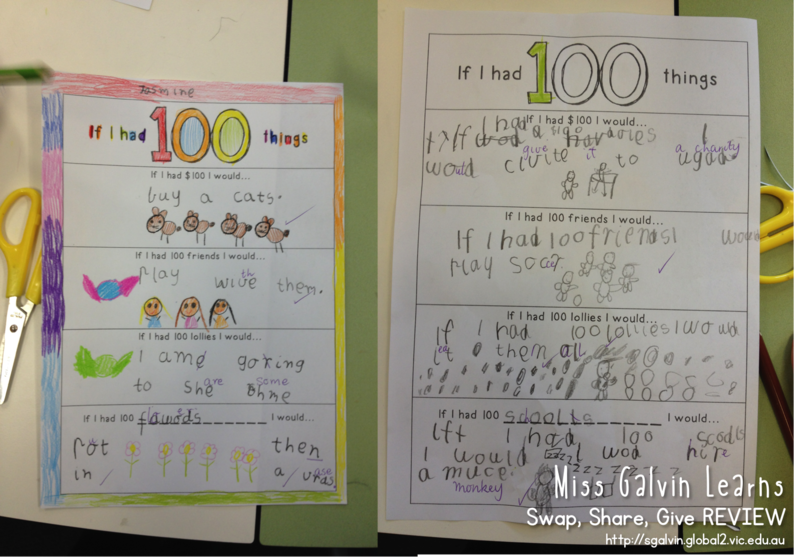 This was another early finisher’s task that I had for the kiddos – and can I just say, they were SO amazed that they could write ‘100 letters’ (Preps AND Grade 1s!). It was really adorable and they really, really loved this task. And some from my Preps! 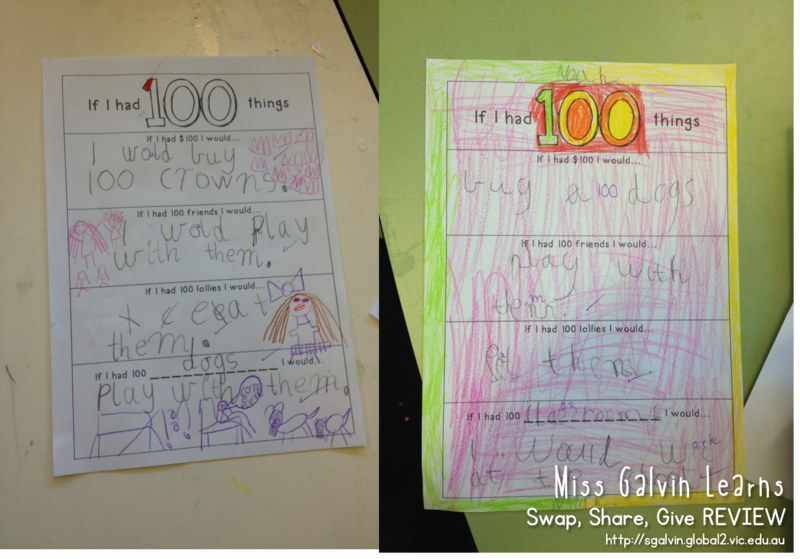 Some great ‘100’ visualising mats and a 100 Days of school poem! My preps used the blank mat to stick down 10 groups of 10 objects that they all bought from home. We all read the 100 days of school poem and it was decorated and pasted into the back of their Literacy journals with the other poems we’ve read this year! Some of our groups of 100! Crowns and placemats and a fantastic colouring page! One of my kiddos modelling her 100 Days of School crown! All-in-all, I was blown away by Jemima’s pack – it was fun, easy to print and implement and provided a lot of options, which (for someone teaching a composite class) is just awesome! I know for a lot of your 100 Days of School is still a long way off, but I would seriously urge you to add Jemima’s 100 Days of School Party Pack to your carts right now to have it ready for your 100 days of school! As part of our linky I’m going to share TWO freebies with you – one of mine, and one from Jemima! Click the image above (or here) to download this freebie! If you’re looking for my other freebies, simply click here. The last component of our linky is probably my favourite: the giving part. If you head over to Bec’s blog (Books, Bugs and Boxes) you have the opportunity to enter a giveaway to win ALL of the packs that were reviewed as part of the linky party. And don’t forget to head on over to Luck’s Little Learners to see Jemima’s review of my activity Hens Love Tens: A Skip-Counting Game. This has been a super fun link-up series, and definitely a way to ensure that I’m posting during the week! Click on the banner above to visit The Teaching Tribune and join in the linky fun! Two for Tuesday 50% Off! Linking up once more with The Teaching Tribune for their wonderful Summer Bloggin’ series. These two products are perfect for those preparing for a new school year! In need of some interactive decodable books for your beginning readers? Look no further than these simple, easy to put together readers with a focus on initial letters. Over 200 pages for $3.50 in my TpT Store. Don’t forget to visit the link-up by clicking on the banner above and checking out the other amazing deals today!